Gene Lee Franklin also faces charges of aggravated assault with a firearm, possession of a firearm by a convicted felon and resisting arrest with violence. 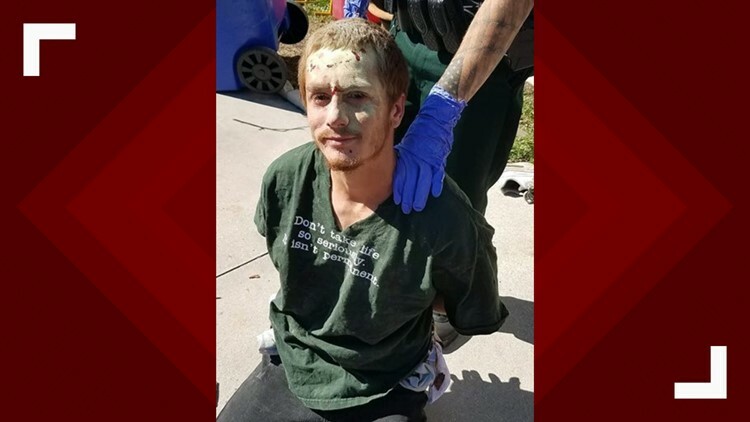 An Indian River County man wearing a shirt emblazoned with "Don't take life so seriously" was arrested Sunday on numerous charges after a reported shooting. The sheriff's office said Gene Lee Franklin, 27, had "confronted a female over a welfare check call." Deputies say another man saw the confrontation and approached Franklin. The two men began arguing and at one point Franklin pulled out a gun from his waistband and shot at the other man, deputies say. Deputies say Franklin then ran away from the scene. Deputies weren't able to find Franklin until Monday afternoon at a different residence. When deputies ordered Franklin to come out, law enforcement said he refused. When Franklin appeared in a window holding a cellphone in one hand and nothing in the other, deputies say they used a "40MM less than lethal launcher" and got him to come outside. Franklin was arrested and charged with attempted murder, aggravated assault with a firearm, discharge of a firearm in public, possession of a firearm by a convicted felon and resisting arrest without violence.